Last week I took a week of vacation. Well, a "stay"cation...well, actually, a "honey, we've got to get the basement tiled and you need to do it"cation. You get the idea. It's also interesting the opportunities, when we are looking, we have to teach others important aspects of the nature of God, the salvation God offers, or to simply share what God is teaching us. The other morning I was taking our oldest to school. We were talking about the seasons of the year and how winter is, far and away, my least favorite season. Then came the question that opened the door: Why? There are all sorts of reasons I listed: it's cold, it's muddy, gloomy, the kids have to stay inside (and thus are more likely to drive everyone absolutely insane - I kept that part to myself), just to name a few. Then, in a moment of clarity, I realized that God opened a door for me. Me: You know what winter reminds me most? Everything is dead. That reminds me of my sin. All the things I do wrong are as ugly, more ugly, as my sin. Because of sin, I am dirty, my life is gloomy, and hopeless. But do you know what my favorite part of winter is? The end of it. I know spring is coming. You know what spring brings? LIFE! Trees start budding, flowers grow, grass turns green, everything comes back to life! That reminds me that my sin is not the end of the story. It's because of Jesus' death on the cross that I, too, have life. He forgives my sin, washes me clean, and gives me new life! That's why I can tolerate winter, because spring is coming. No, there was no major conversion moment. We weren't rushing to the nearest body of water for a baptism, but it gave them something to think about. Seeds were sown. God alone can do the rest. How to we ensure that we are prepared for opportunities? 1. Be in the Word. This is critical for every Christian. We will not hear the leading of God without the Word of God. Invest it in your life. If you need help learning how, ask me, ask someone, whatever you do, don't let more time go by without being in the Bible. 2. Pray for opportunities. Ask God for opportunities to share the hope that you have. I will 100% money back guarantee He will provide. Be specific. If there is someone you know you need to talk with, ask God for opportunities with the person specifically. 3. Speak up. With gentleness and respect, respond to the opportunities. Whatever you do, remember the gentleness and respect part. Imagine how differently my conversation could have gone if I simply said: "Winter reminds me of my sin and if I have sin I am going to burn in hell. You want that for your life, kid? You better straighten up your attitude then!" Imagine how scarring that could be! More damage has been done against the Kingdom of God by Christians who were arrogant, condescending, and rude. We have to remember that unbelievers are not approaching life with the same worldview as you. We cannot expect a non-Christian to act like a Christian. We can expect, however, a Christian to act like a Christian. Use gentleness and respect. Don't force it. Everything doesn't have to be a "lesson." 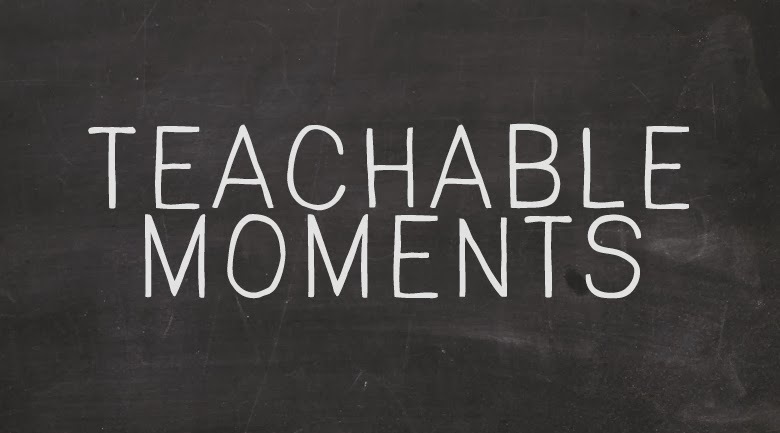 Pray for wisdom in choosing the right moments. 4. Pray again. Pray that God will bring life. You can't do that. Only God brings life and hope. Allow All Scripture is God-breathed and is useful for teaching, rebuking, correcting and training in righteousness, so that the servant of God may be thoroughly equipped for every good work. to be used by Him how He sees fit and trust Him with the results. I believe if we are actively and wisely listening and looking for opportunities, you'll see a whole new world before you. Look for where God is at work and join him. Last week I talked about our tendency to live "fake" lives in an effort to put up the facade of perfection that culture seems to call us to. If we're honest, sometimes we feel freedom in wearing these masks, hiding who we really are. But is that really freedom? How can we start living see-through lives? Becoming free from the "fake" starts in being content with who you are. say than it is to love. Contentment is very difficult to find and keep. Trying to put on the air of perfection and "fitting in" with culture or community can sometimes limit our freedom. We can become prisoners of our own choices. Go into debt to get that house or car to "keep up." We find ourselves so strapped for cash that it adds undue stress on our marriage and families. We feel the weight of a responsibility we are not capable of handling on our own. Shying away from opening our homes to others because we don't want anyone to see what we don't have or how we live. All of these things can imprison us and limit our freedom. What is the solution? Contentment. Ah...again, easier said than done. The Apostle Paul wrote in Philippians 4:11 - "I have learned to be content whatever the circumstances." Paul faced public stoning, beatings, and imprisonment and that's just touching the surface. Yet somehow, we found contentment. I would admit that early on in our marriage that Kari Jo and I felt the pressure to "keep up with the Joneses." It's only by the grace of God that we didn't get in over our heads with debt. But our desire to have the things that the people around us had could easily consume our thoughts and time and before we knew it jealousy and envy crept in and had the potential to damage relationships with those around us. How do we find the contentment Paul speaks of? Contentment comes with practice. It takes the determination to capture every thought and reframe it, realizing that there are blessings in your life. They might be different than you'd prefer, but they are there nonetheless. (There's also the other side of things...when we are envious of what others have, what's the liklihood that they are imprisioned by some of their own choices and the "perfection" you see in them is really just a mask? My guess...100% certainty.) The grass is always greener on the other side? It might do some good to stop and look down and see that you're grass is just as green, maybe just a shade different. Throw off the "fakeness" that hinders you. I love Hebrews 12:1-2 - Therefore,since we are surrounded by such a great cloud of witnesses, let us throw offeverything that hinders and the sin that so easily entangles, and let us runwith perseverance the race marked out for us. Let us fix our eyes on Jesus, theauthor and perfecter of our faith, who for the joy set before him endured thecross, scorning its shame, and sat down at the right hand of the throne of God. Remember that you are God's masterpiece created to do what He has prepared for you, not what He's prepared for someone else to do. Forwe are God’s workmanship, created in Christ Jesus to do good works, which Godprepared in advance for us to do (Ephesians 2:10). Let me leave you with this challenge...give living a see-through life a shot. Determine to not care what others think. It's not going to be easy at first, but I can assure you there is great freedom to be found! I can not change anyone, but I can love a few. But I can love a few. Let’s give that a try this week without expecting anything in return. I used to have a poster in my office similar to this. It simply said, "If you're not serving, you don't get the point." It was actually an advertisement for a missions organization. The volleyball in the picture was filled in with a map of the earth. It was a reminder that our purpose in this life is to seek and save the lost. That, most often, happens through serving others. 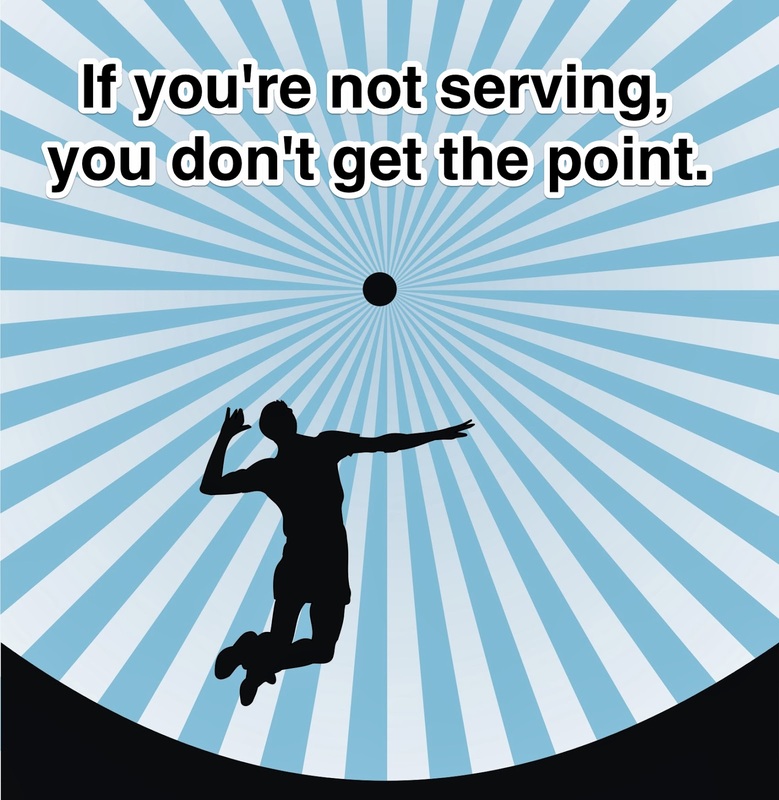 Serving is not simply a "good idea," it is what we are made for. As we continue our "I Am A Church Member" series, I would say again, "If you're not serving, you really don't get the point." in service to share Christ outside the church. One of our members picks up a 10-12 guys from the Healing Place to play basketball on Monday nights, an opportunity many of them would not otherwise have during the winter months. Another small group has prepared food and delivered supplies to the Green River Ministries homeless shelter. We have a group of men and women who consistently provide worship opportunities at the Taylor County Detention Center on Sunday's. Diapers are being provided to the Crisis Pregnancy Center. Baptisms, Football, and Bill Nye. 1. Yesterday during 2nd service something special happened. First, baptisms are always special, but, in my opinion, a father baptizing his child is beautiful. I hope I get that privilege one day. A very special moment! 2. Yesterday was the Superbowl and I couldn't care any less, but I watched it. Whether you're a Seahawks fan or a Bronchos fan you can certainly appreciate that there are some stand up guys on the Seahawks (I'm sure there are some that play for the Bronchos too, but they weren't featured on this "Making of A Champion" video featuring the Seahawks). 3. Tomorrow night Bill Nye (the Science Guy) is going to debate Ken Ham (the guy behind the Creation Museum and Answers in Genesis). The subject is simply this: "Is creation a viable form of origins?" Simple enough. I am very interested in the content of the debate, but what concerns me more is how we respond. No one will "win" this debate. Even among Christians there is such a widely varying opinion on the interpretation of the Creation account (most of which respect the authority of Scripture and are honoring to God) and that helps me realize this is not a problem to be solved, but a tension that we will always live in. Our responsibility is to act like Christians, first and foremost. People on "the other side" of the argument are not the enemy, Satan always has and always will be our enemy and his goal is to make Christians seem irrelevant and judgmental. I hope that we will not help our adversary out in our response to this debate on social media or in our public discussions. You can watch the debate live tomorrow night at 7:00 PM (eastern) right here.